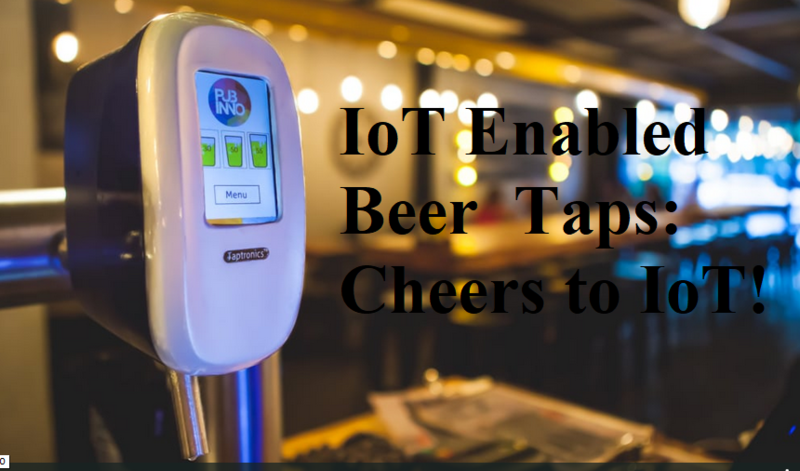 IoT Enabled Beer Taps : Cheers to IoT! It mostly seemed to be a marketing slogan when a few years ago elites were talking about how IoT can concur in every corner of plant earth as it can basically be embedded in every THINGS. Nowadays we are not surprised even if strange THINGS are connected, but beers in pubs could have been the last one we thought of. Pioneers like Pubinno are among those who redefines how a business can operate by pushing into new frontiers. Pubinno is a young and rapidly growing technology company, which unites business-driven and passionate individuals who believe in IoT revolution and are ready to disrupt the beverage and hospitality sectors with its patented, next-gen, smart dispensing solutions. “Pubinno is a San Francisco based technology company, developing Smart Beer Taps that serve perfect beer and boost profits. Pubinno’s leading product, Taptronics™, is a plug & play, smart and connected draft beer tap combining robotics, IoT and AI. Taptronics™ delivers rich and smooth foam that produces a wonderful drinking experience.” said Mr. Necdet Alpmen, CTO & co-founder. He added that “As a fast-growing company, Pubinno is working closely with the largest beer brands in the world such as InBev Turkey. Pubinno’s products are being used over 200+ bars and pubs across USA, Germany, Italy, India, Israel, Netherlands, Turkey and more to come. A total of 300.000 glasses are being served monthly through Taptronics™. Taptronics™ is a smart and connected draft beer tap. It serves the perfect beer, for every single glass, with a single touch. It also provides up to 20% savings to restaurants and bars by eliminating waste & fraud. Our AI powered flow algorithm uses user interaction and sensor inputs together with patented robotics technology, to guarantee the best drinking experience with precise portions. With Taptronics™, consumers get the perfect beer, bar managers increase profits and brands gain access to real time sales, inventory and quality data to ensure quality standardization across all sales outlets. Welcome to the future of the draft beer industry. BeerPoint a product of Pubinno. BeerPoint is an IoT enabled, self-service beer dispenser. BeerPoint operates with prepaid NFC cards that are sold in the sales outlets. Customers can purchase preloaded cards and get their drink with a simple tap. By serving a glass of beer in less than a minute, it reduces the waiting time and gets satisfied customers back to you again and again. We can implement BeerPoint in any Event Hall, Bars and restaurant.